It is easy to get caught up in the stress of college, especially when you have to balance it with your career, your relationships, and the overall journey of life. We hope to be a place where you can channel your stress into a creative activity, and maybe even make something you will keep for years to come! 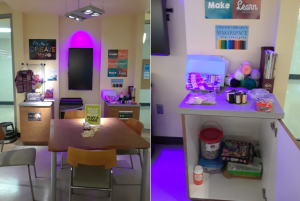 The Chester Campus Makerspace was initiated in mid-August 2018. It’s located to the left of the entrance as you walk in. You’ll find a tiered display showing off the results of our latest event, followed by an alcove of two cabinets and shelving that houses the variety of crafting supplies we have. There are games on nearby tables, as well, including chess, dominos, and more! There are numerous places online where you can find inspiration when working on an activity. A quick internet search can get you some results, for sure, but we’ve already done that for you. Feel free to browse other places, anyway. It won’t hurt our feelings. Much. We have a Pinterest page specifically for our Makerspace, and you can find it here. theatlantic.com: The Atlantic has a lot of reading material on a variety of subjects, but this particular article here deals with “How Libraries are Becoming Modern Makerspaces”. edweek.org: This has a number of articles dealing with Education in general, but the one linked here speaks specifically to “Why Makerspaces Are Perfect for School and Public Libraries”. makerspace.com: There is an actual website called Makerspace.com, wherein you can find all sorts of information about Makerspaces. The page we’ve linked to here is an introduction to what a Makerspace is. renovatedlearning.com: Renovated Learning is all about moving education into the 21st century. Most of the content here focuses on the virtues of including a makerspace in your classroom (though for us, obviously, we must adapt these ideas to a library setting). Here is an article that attempts to shed light on “Defining Makerspaces: What the Research Says”. There you go! To learn more, go to the Library Space entry here from April 2018 detailing what the Midlothian Campus Makerspace has to offer. It’s worth the read! Stress is omnipresent in our times, whether we are at work or pursuing our private interests. All people have stress. And even a child in the womb already experiences stress – both positive and negative – through his mother’s circumstances. There are a lot of tips that are easy to incorporate into your everyday life and methods that you can learn and apply. And even if it seems like only small changes that you make. They help you to learn how to handle stress in a healthy way.